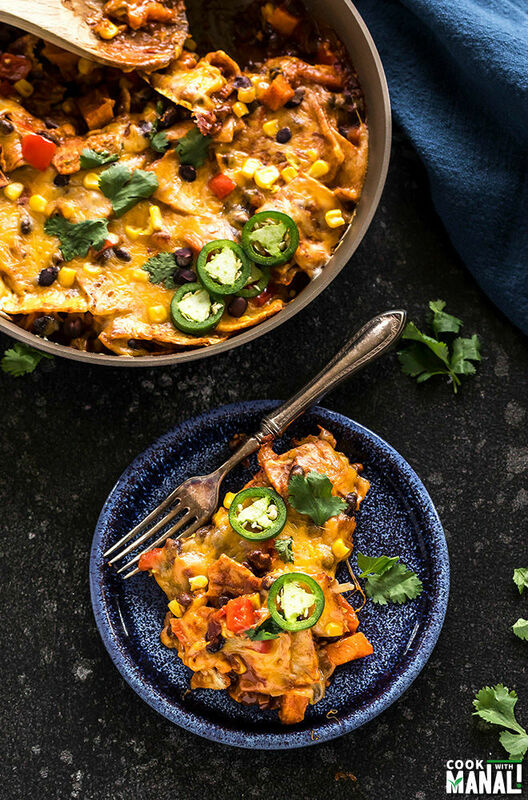 Packed with flavors, this easy One-Pot Vegetarian Enchiladas is a great meal for the whole family to enjoy during the holidays. 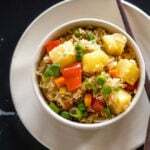 The best part about this gourmet looking meal is that it comes together in one skillet and under 30 minutes! This is my favorite time of the year. Agreed, it’s super dark and gloomy here in Seattle but it’s just so festive everywhere and the good food makes it even better. I love having friends and family over for dinner this time of the year. 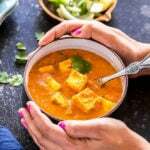 However as much as I love spending time in the kitchen, I am always looking for recipes which I can I can whip up in no time! 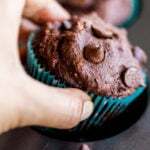 Brownie points, if they look super fancy and gourmet with less effort. Now, those are my favorite type of meals! Don’t you guys agree? Less Effort + Gourmet Meal = win win situation! The holidays can super busy, I get it. There’s just so much to do from doing stuff around the house, buying presents, sending in the cards and the list goes on. However, the most important thing in my opinion is to spend time with your family. 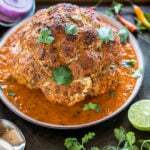 And because I want to spend more time with my loved ones during the busy holiday season, I love relying on easy recipes. 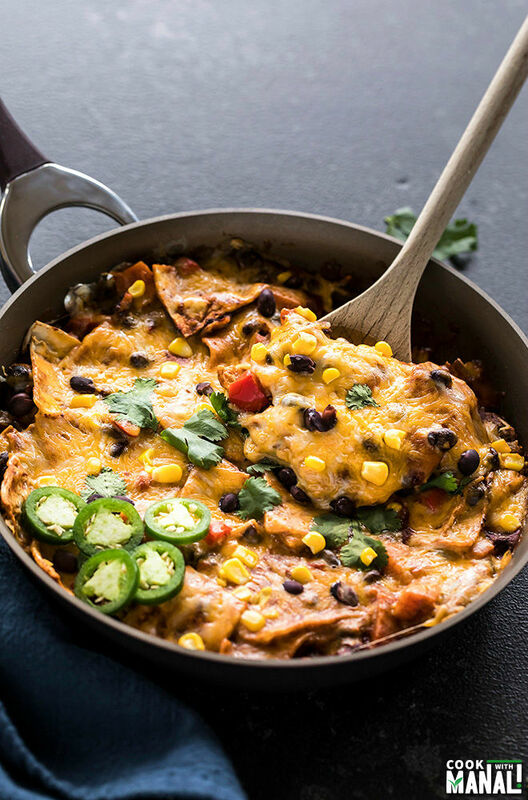 For example, this easy stove top and One-Pot Vegetarian Enchiladas! Made in the new Circulon Symmetry Merlot French Skillet, this meal comes together under 30 minutes! And doesn’t it look super fancy and also so delicious? ✓ gets done in 30 minutes or less! I made this stove top vegetarian enchiladas using the new Circulon Symmetry Merlot Collection. It features the premium TOTAL® nonstick system making it durable and resilient. The nonstick technology that Ciruclon uses in this set is advanced, making it last 10 times longer than ordinary nonstick. Also the merlot color is gorgeous! I have been using the pans pretty much everyday since I got them. There’s nothing that sticks and the clean up is so easy. It’s also dishwasher safe and oven safe up to 400 F.
And you guys know the best part? Thanks to my friends at Circulon, one of you can win the Ciruclon Symmetry Set! Yes, head over to my Instagram account, simple follow the rules to enter and giveaway and you can win this gorgeous cookware set just in time for the holidays! 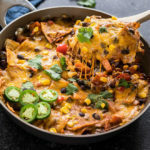 How To Make Stove Top One-Pot Vegetarian Enchiladas? Chop your veggies and have everything read to go. Also cut the tortillas into small pieces. I usually cut them into 2 x 2 squares but it’s just an approximate. You can just tear them randomly too. The best part about this recipe is that there is no rolling the tortillas like you would usually do while making enchiladas. Here, you just add everything to the pan and get the same flavors without the extra work! Once you have added everything to the pan and your veggies are cooked, you finish off with cheese. Yes, lots of cheese! 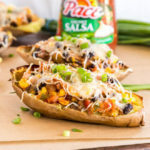 I love using a Mexican cheese blend here but you can use any cheese that you like. You can also increase or decrease the amount of cheese to your taste and preference. 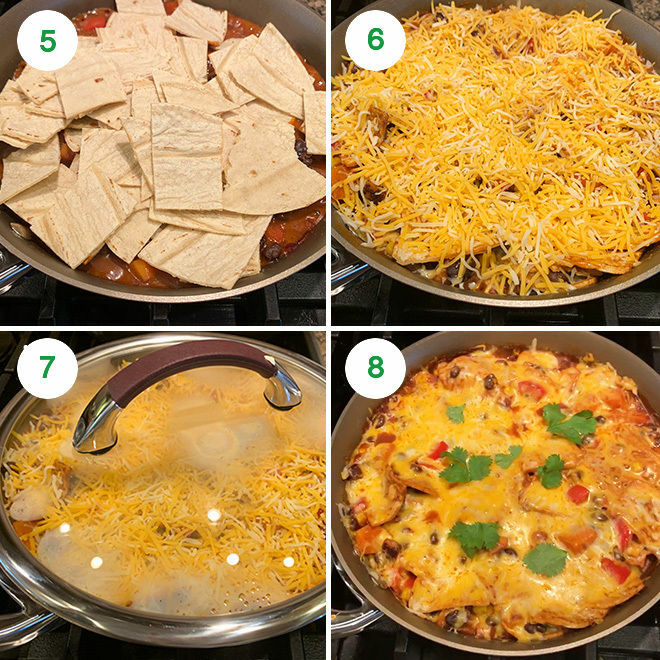 So let’s see how easy it to make stove top & one-pot enchiladas using Circulon Symmetry Merlot Skillet! And don’t forget to enter the giveaway to win one for yourself! 1- Heat 1 tablespoon of olive oil in the 10-inch Circulon Symmetry Merlot Skillet. Once the oil is hot, add the onion and the garlic and cook for 2 minutes until the onions soften. 2- Then add the chopped red pepper and sweet potato. 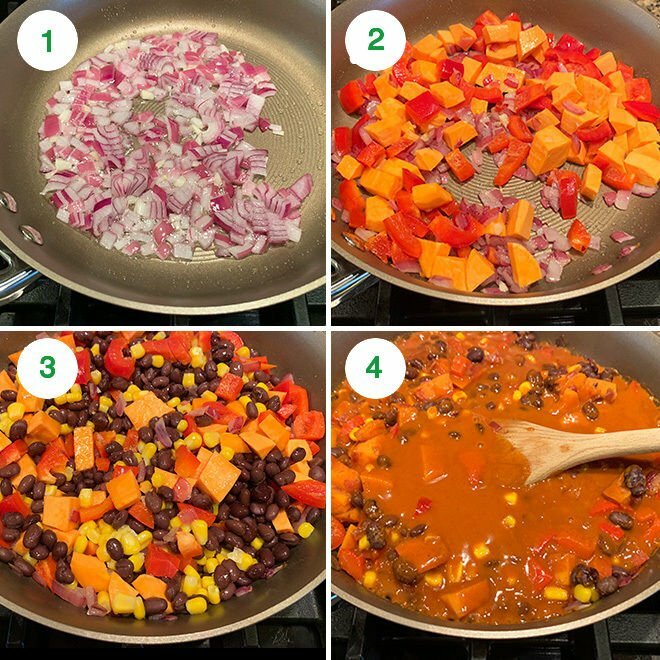 3- Also add the black beans and sweet corn along with ground cumin, smoked paprika, chipotle powder (if using), salt and mix until everything is well combined. Cover the skillet and cook the veggies for around 5 to 6 minutes or until done. 4- Stir in the enchilada sauce and mix. 5- Then add the cut corn tortillas and stir gently. 6- Top with the cheese and then set heat to low. 7- Cover the skillet and let the cheese melt on low heat for 2 to 3 minutes. 8- Turn off the heat and let it remain covered for 2 more minutes or until the cheese completely melts. Garnish with cilantro. 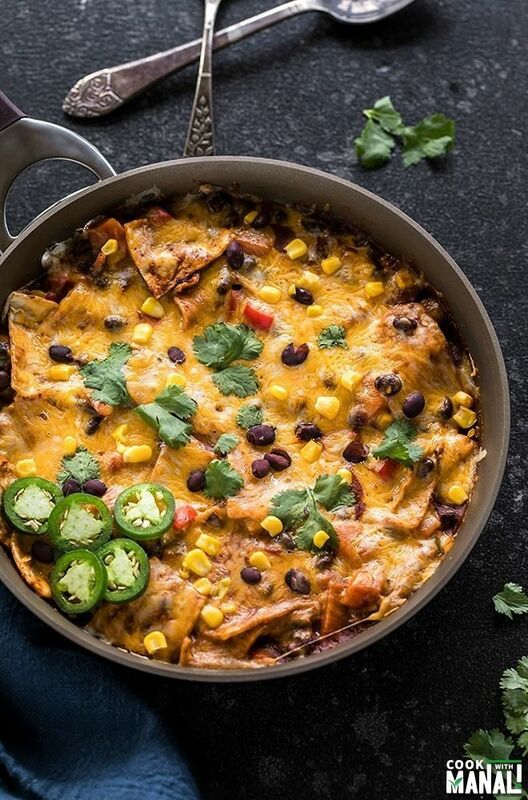 Serve the one-pot vegetarian enchiladas with sliced jalapeños! 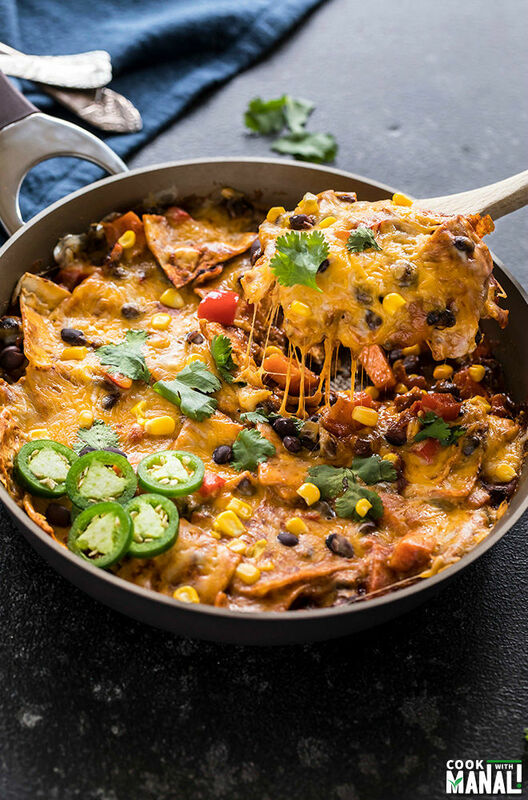 If you’ve tried this One-Pot Vegetarian Enchiladas Recipe then don’t forget to rate the recipe! You can also follow me on Facebook, Instagram to see what’s latest in my kitchen! 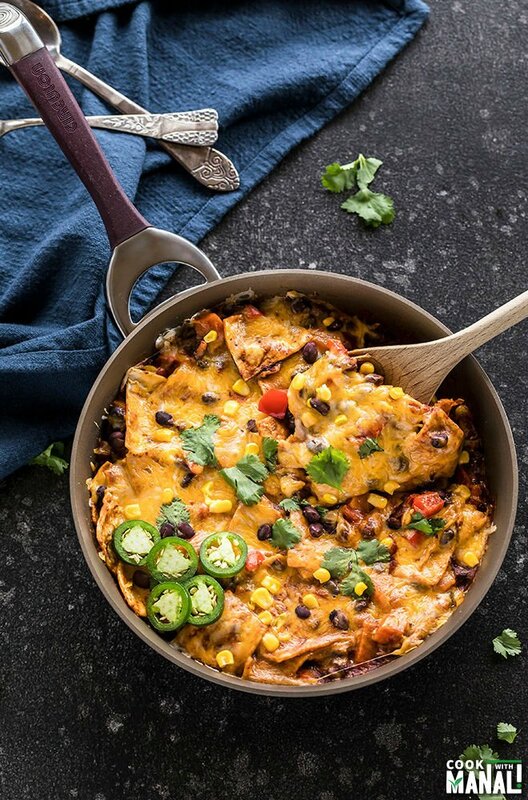 Packed with flavors, this easy stove top and one-pot Vegetarian Enchilada gets done in less than 30 minutes and is a great meal for the whole family to enjoy! Heat 1 tablespoon of olive oil in the 10-inch Circulon Symmetry Merlot Skillet. Once the oil is hot, add the onion and the garlic and cook for 2 minutes until the onions soften. Then add the chopped red pepper and sweet potato. 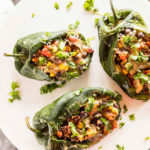 Also add the black beans and sweet corn along with ground cumin, smoked paprika, chipotle powder (if using), salt and mix until everything is well combined. Cover the skillet and cook the veggies for around 5 to 6 minutes or until done. Stir in the enchilada sauce and mix. Then add the cut corn tortillas and stir gently. Top with the cheese and then set heat to low. Cover the skillet and let the cheese melt on low heat for 2 to 3 minutes. Turn off the heat and let it remain covered for 2 more minutes or until the cheese completely melts. Garnish with cilantro. Serve the vegetarian enchiladas with sliced jalapeños! 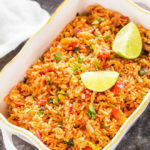 One pot meals are fantastic…this is so yummy and flavoursome! Nice-looking pan, great-looking dish. I also love that blue plate! Thank you! The pans are indeed beautiful! I had a quick question..do I have to use that pan or can I make this in any non-stick pan? Hi Sania! 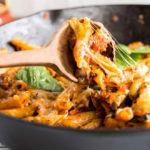 You can make it any pan but I prefer these pans from Circulon..they are really easy to clean, sturdy and the lid makes it easier for the cheese to melt..